Okay, I have a pattern. On this blog. I write either about desserts or pasta here. I have a proof. But what can I say?! They are two of my favorite things. The weather here is not helping the matters either. This rainy, gloomy weather forces me to switch on the oven almost everyday! It makes me add cinnamon to every sweet stuff I bake so that the house smells like Fall. I am craving soups and wearing cardigan while going out. Gosh, how I am in love with the weather right now!! You guys know I am all for skinny dishes. But that does not mean I do not like eating overloaded cheesy goodness. In fact, I LOVE it so much but just NEVER make it. I can’t bring myself to add a pound of cheese to any dish knowingly. Period. This dish here is in no way skinny. But not unusually loaded either. Something in between. A dish I would dive in. It is everything I had hoped and dreamed for in baked pasta. There’re pillows of corn and asparagus throughout. There are decadent, gooey cheese pulls stretching from every forkful. And it is easy. Yes, as easy as this simple mac-n-cheese I know how to make. So make it NOW as there is no reason to keep yourself away from such a bliss. Preheat the oven to 180ºC / 350ºF. Boil a pot of water with generous sprinkle of salt. Add Orzo, corn kernels and asparagus to the boiling water. Let it boil for 2 minutes and after that save 1/2 cup of water. 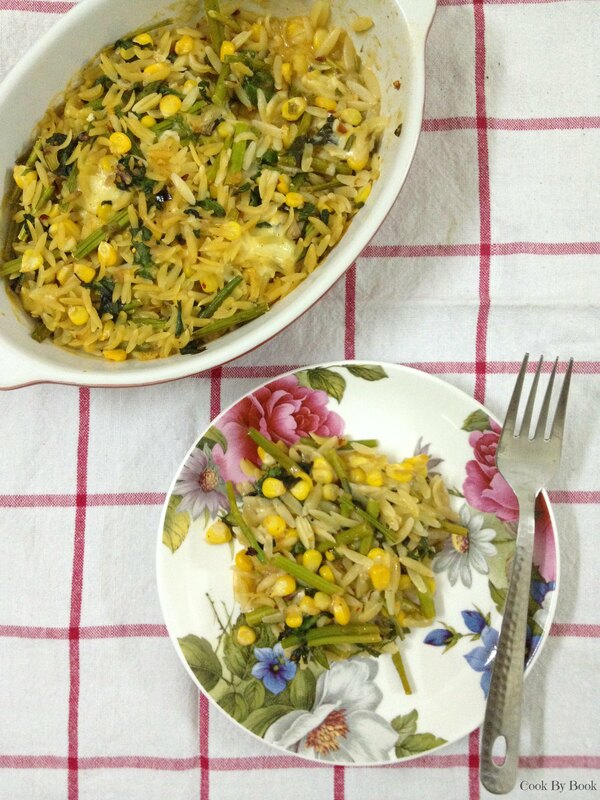 Drain Orzo, corn kernels, asparagus and set aside. Simultaneously heat a large frying pan over medium-high heat. Add oil to the hot pan and once oil is shimmering, add the shallots, garlic and celery. Cook for 3 minutes or so till shallots turn translucent. Add tomato paste, Orzo, corn kernels, asparagus and cook for 3 more minutes. Off the heat. Immediately mix-in spinach leaves. Add Parmesan, Mozzarella, salt, pepper, oregano, red chilli flakes, lemon zest and pasta water and mix well. Transfer mixture to a small oval or 6×6-inch square ovenproof baking dish. Cover with foil and bake for 15 minutes, then bake for 15 minutes without the foil. (You can change ratio of foil-on to foil-off time as per your preference for crunchy pasta lid.) Let rest for 5 minutes before serving. 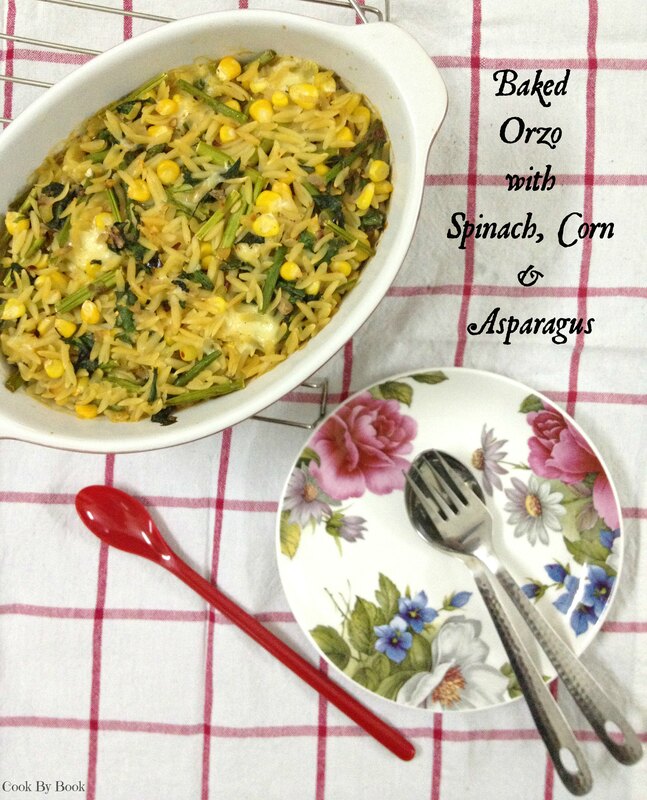 *You can use whole-wheat Orzo or replace Orzo with any other small-sized pasta. *I used pasta water and did not feel that the dish was lacking in flavor at all. But if you do not like using water then use vegetable stock. It’s my Mother’s Birthday today! She is the most special woman in my life. She is my first best friend and I have had heaps of special moments with her. She handed down so many traits of hers to me… We both love bags, shoes, clothes and FOOD! She is such an awesome cook! As already confessed in my intro page, I never learnt to cook before I got married and being such a great cook that she is, my mom was quite concerned about that part. She sincerely wrote down all her recipes in a diary for my convenience and gifted it to me on my D-day. That is my most prized possession and a lovely gesture on my mom’s part! I should soon get down to posting few of her special recipes! I love Caprese in any and every form! 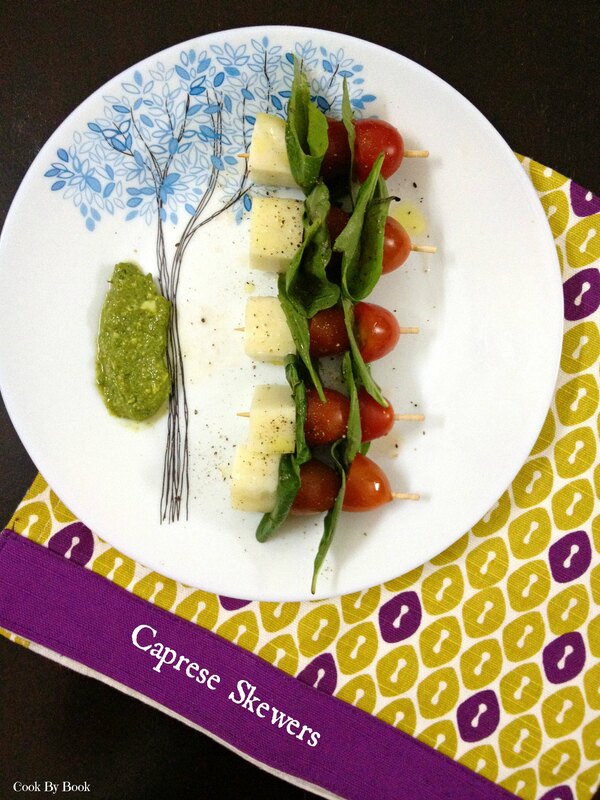 You must remember I once created this unusual ice-cream with it and these skewers served with pesto! 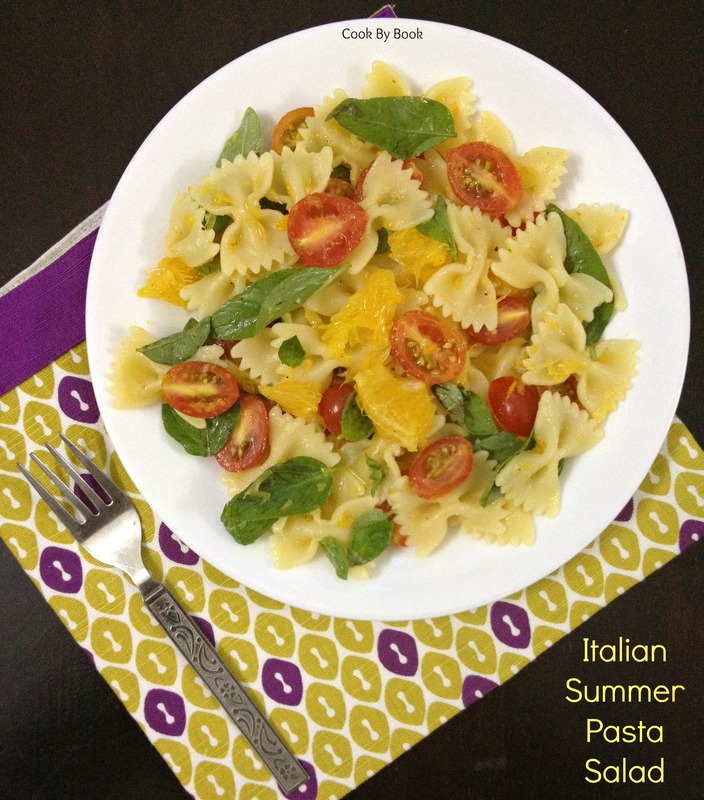 This time I brought together 2 of my favorites and created this dee-lish caprese pasta salad. 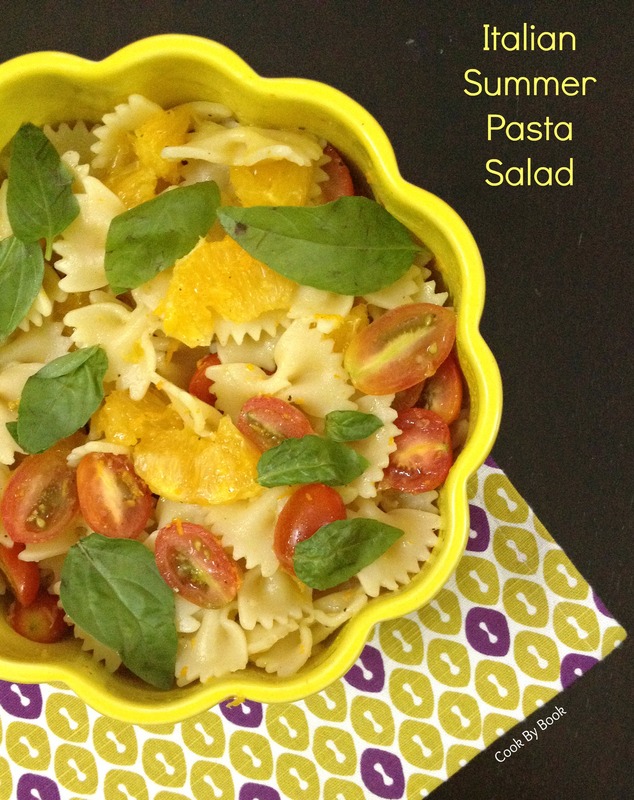 Of course with a twist… I added capers for a little tang! And it really did wonders. 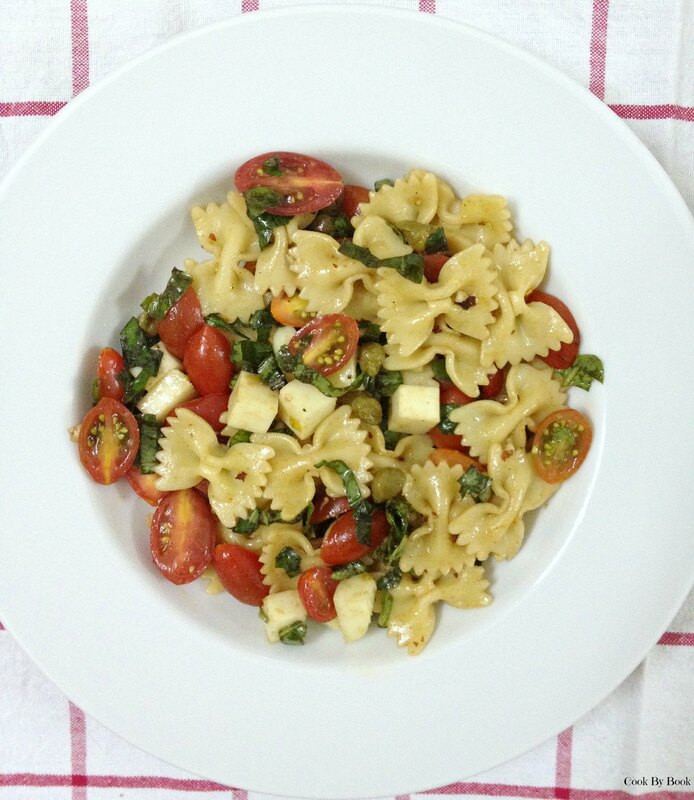 This salad is so beautiful, adorned with pear tomatoes and bursting with basil! Hope you enjoy this as much as we did! Happiest of Birthday Mother! Cheers!!! Cook pasta in generously salted boiling water according to package directions till al-dante. Drain and rinse with cold water. 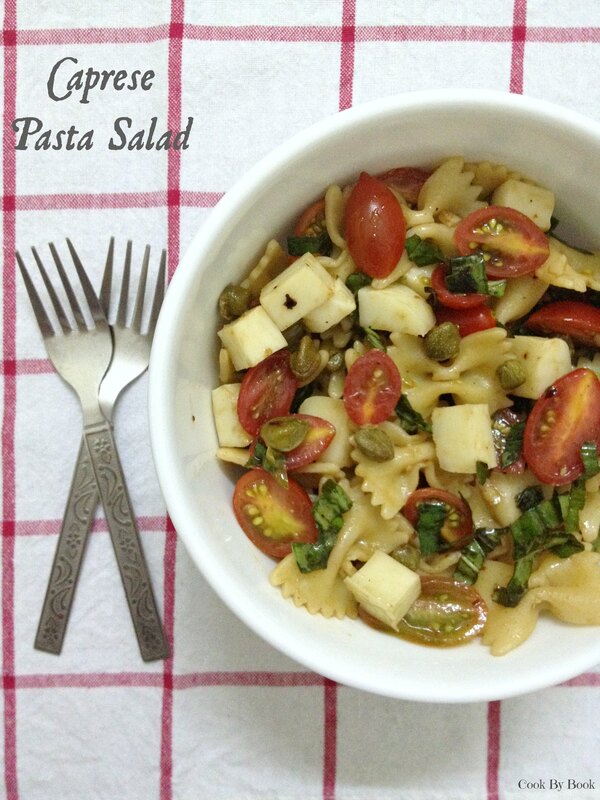 In a large bowl, add pasta, sliced tomatoes, Mozzarella cheese cubes, capers and toss. In a small bowl, take all the ingredients mentioned under dressing and whisk. Add the dressing to the large bowl of salad ingredients and toss well. Taste and adjust the seasoning. Let it chill in refrigerator for half an hour. Top with sliced basil leaves just before serving. And it really happened to me! Something really tiny, to prove it right. But it did happen and now I have altered perspective.. Of course you would have read about this in the book ‘The Secret’ but it is hard to believe anything till you experience it personally. Let me come straight to the point and tell you what exactly happened. There is a place close to my house where my friend once saw a snake and after she told me about this incident when ever I used to pass from that place I used to think about a snake crossing my path. I am pretty scared of snakes and I mean who isn’t! So that anticipation, that fear was always there in the back of my mind. I used to imagine about snake coming out of nowhere and crossing my path every single time! It was and is crazy till now! So this thinking continued for around 4-5 months. And on one rainy evening finally my vision came to life! Instead of one I saw two snakes, intertwined with each other, dancing at tunes being played by rain gods. Oh yeah, there it was! In front of my eyes! I stared in bewilderment! I thanked my lucky stars fervently that I was not on foot and was protected by my car. And even till date, whenever I pass by I still think about the snakes crossing my path. You know how human mind works (or at least mine seem to! )… I try not to think about it but it’s there! So much that I have started skipping that area altogether! So if you are still with me on my randomness (WOW, you are!) let me ask you something.. Is it only me or does it happen with you too? You would want to know why I am writing about it on my blog today?!! As mentioned in my last post I am turning 28 tomorrow and I was just reflecting on what all happened in last year and how I want my life to be in next year.. If our mind and thoughts have power to make it real, why not use it positively? I can constantly think about good things to happen and shape my life accordingly! Isn’t it just genius? !… Things to ponder! It’s my birthday week so I am cooking all of my favorite things and you all know how much I LOVE pasta! 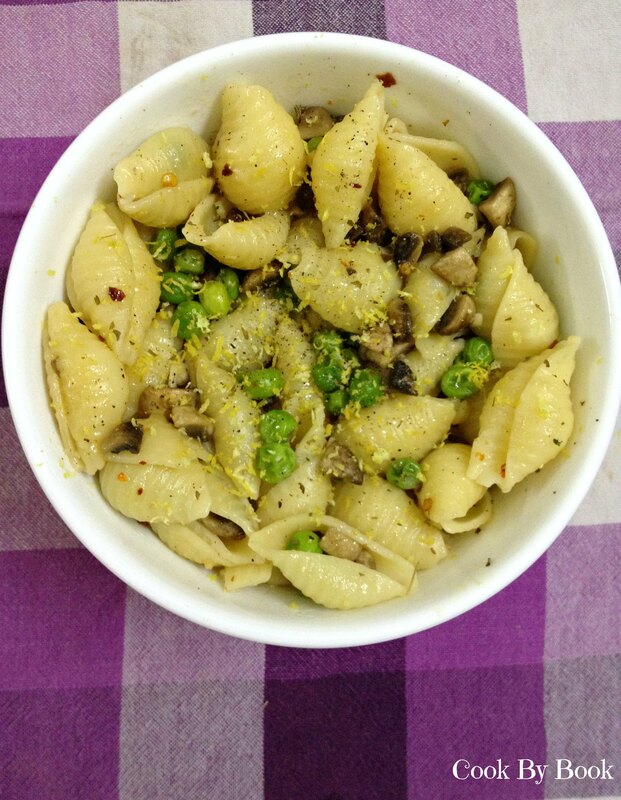 So I made this simple pasta dish with peas and mushroom. 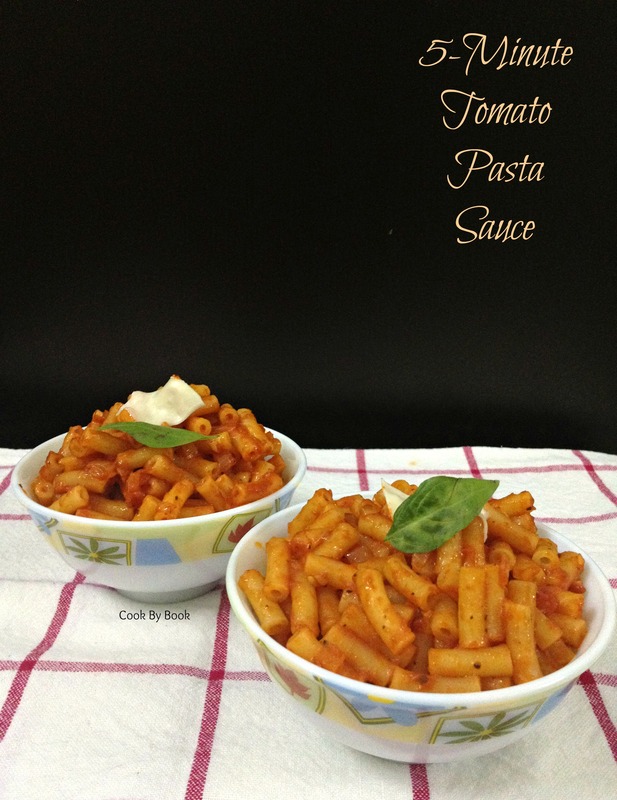 I used Conchiglie pasta in this recipe but you can use any other short pastas you have like Fusilli, Orecchiette or Farfalle. Peas have been mildly blanched so you get the crunchy texture. Tad bit of Cheddar is added to make it perfectly cheesy. Addition of lemon zest just takes it to another level! 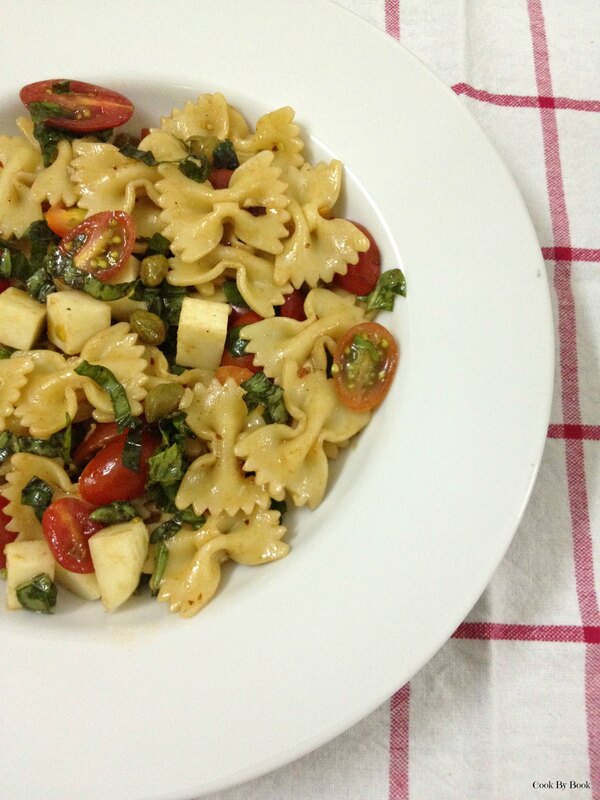 It is light, buttery and perfect for quick lunch/dinner. Cook pasta as per the manufacturer’s instruction. Reserve 1 cup of pasta water. Pour the remaining pasta water over the peas in colander so that peas will get blanched and pasta will get drained. If you want more tender peas then add them to the pasta pot 1-2 minutes left of cooking time. Heat the butter over medium heat in a large saucepan and add minced garlic. Saute it for about a minute, then add mushrooms and saute it for 4-5 minutes until tender. Add onion powder, chili flakes, salt and pepper. Then add 1/4 cup of pasta water and cooked pasta and peas to the pan. Add little more pasta water if required. Turn off the heat. Finish it off with grated Cheddar and lemon zest. Garnish with fresh parsley and serve. As I have proclaimed here before…. I looovvveee pasta! 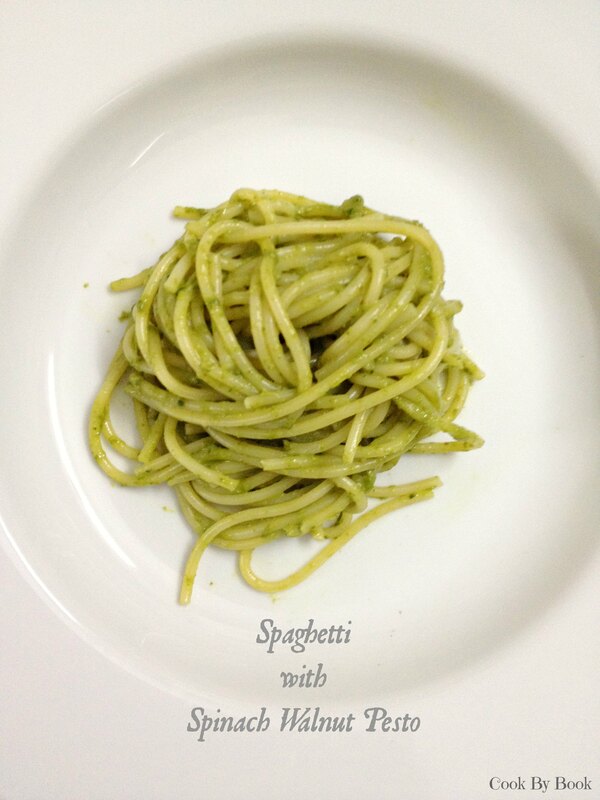 And my all time favorite pasta sauce is basil pesto. 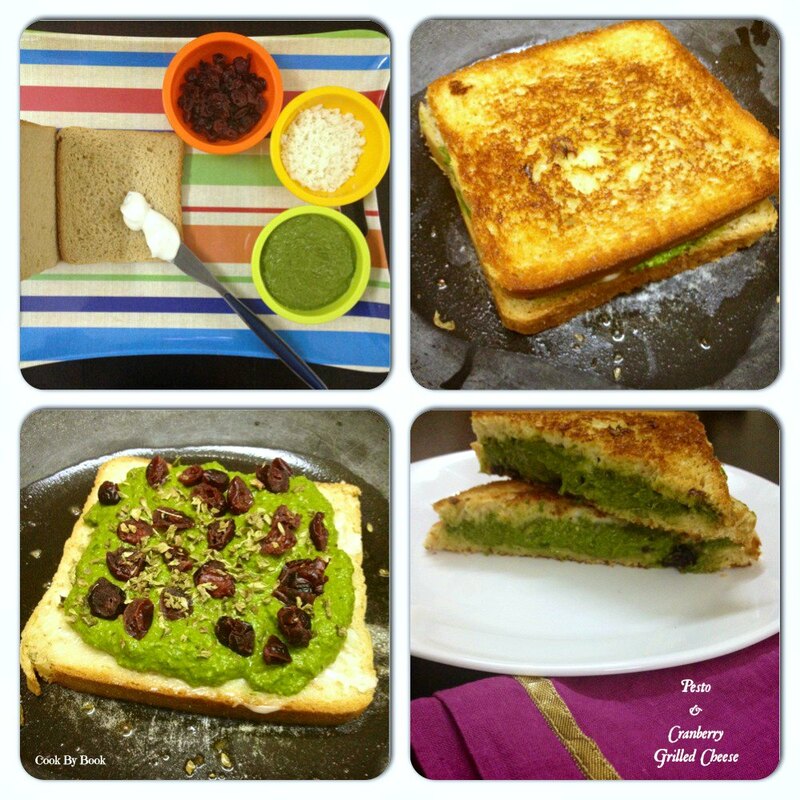 But then I came across this creamy coriander pesto & now, I have a new favorite! On a rainy evening, hubby & I were sipping coffee at our favorite cafe located down the street from our house. They have quite a versatile menu and I really love the place. One pasta sauce in there really caught my eye and I had to order it immediately. 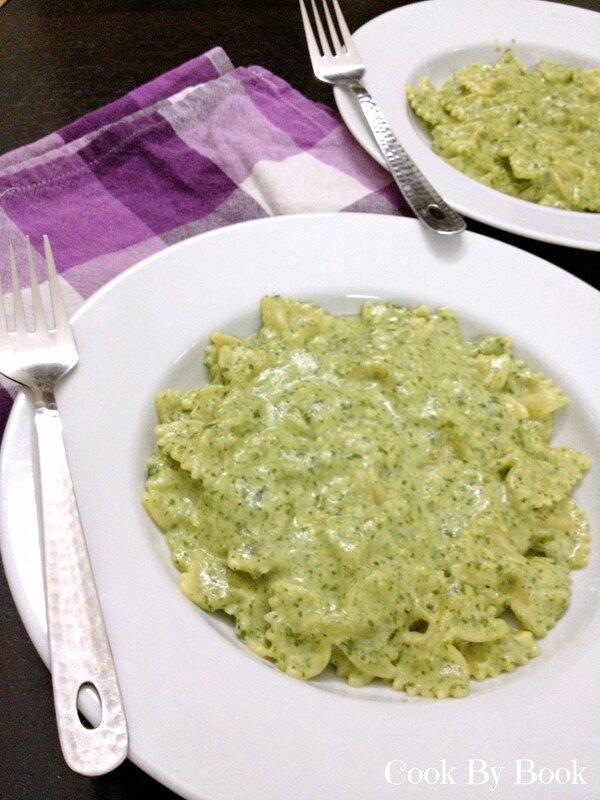 It was a spicy coriander and cashew sauce prepared in cream cheese and was served over Conchiglie (shell shaped) pasta. 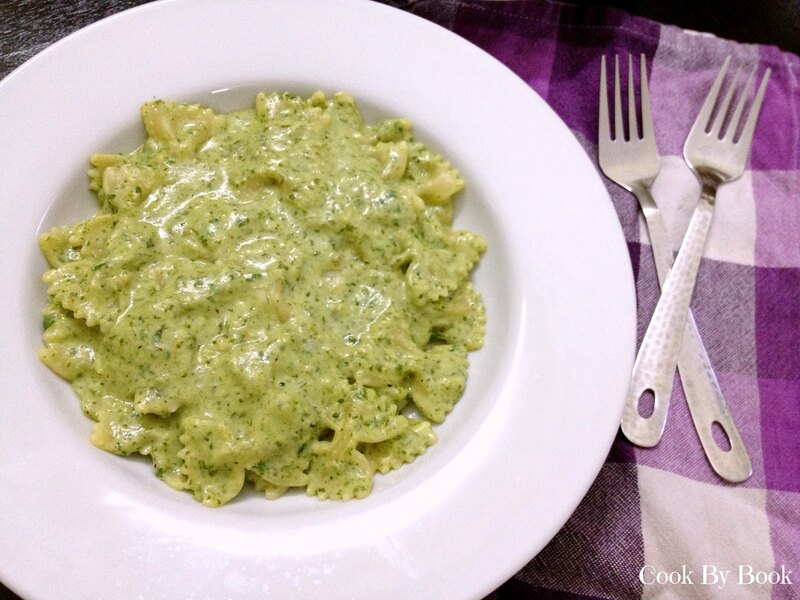 It is a pesto sauce so you have your usual suspects.. fresh herb, garlic and nuts! 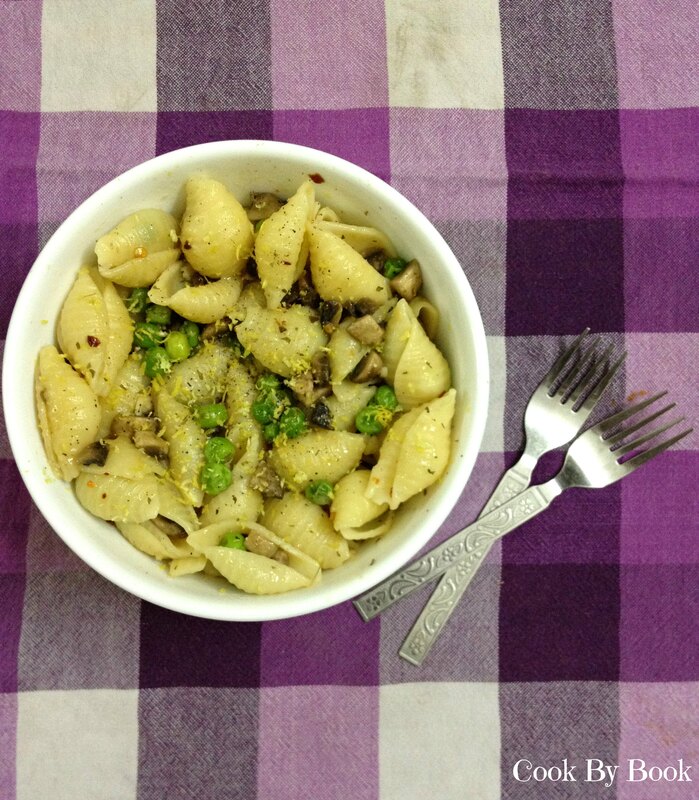 The pesto has a fresh summery fragrance from fresh coriander and a rich texture from cashews. 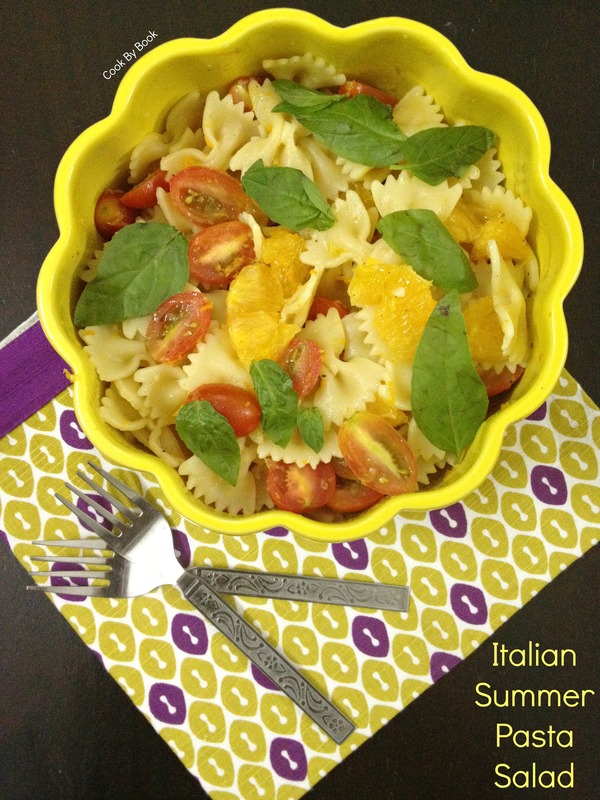 I used Farfalle pasta instead as that is what I had on hand. So let’s get down to the recipe! Cook 2 cups of Farfalle pasta in salted boiling water as per the direction mentioned on the package. 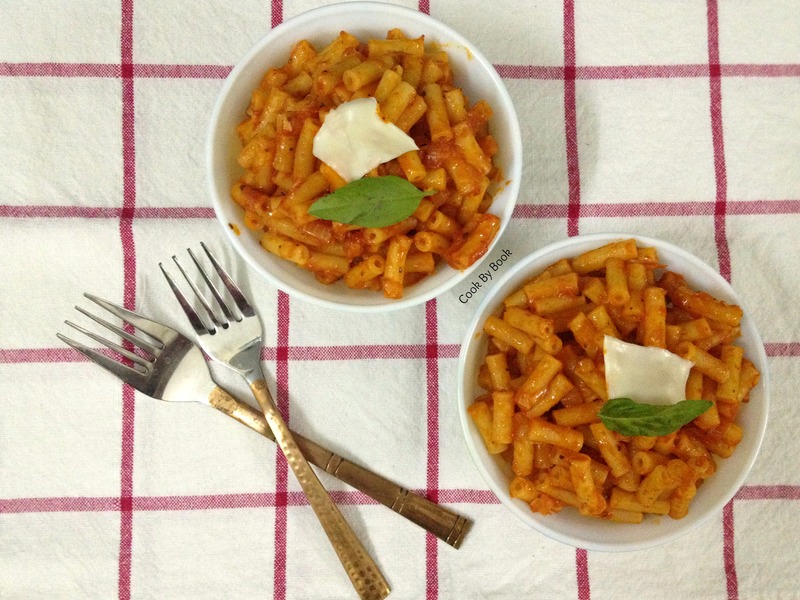 Once pasta has cooked al dente, drain the water and start preparing the sauce. Add coriander leaves, garlic cloves, soaked cashews, pinch of salt and 1/4 cup milk in a blender and blitz till you get a soft puree. Add little milk if required. In a pan, melt the butter and add flour to it. Let the flour cook for about 3-4 minutes on a low heat. Add hot milk and hot water mixture to the pan and whisk to make sure there are no lumps. Add grated cheese. Cheese will melt and mixture will thicken a bit in about 5 minutes. Add pureed coriander mixture in a pan and whisk. Season with salt and pepper as per your taste. Add red chili flakes if you want a hint of spice. Add pasta to this and let it cook for another 2-3 minutes so that pasta has absorbed the sauce. Serve immediately.